Genesis Energy is committed to protecting your information and is aware that from time to time scammers will attempt to target you by fraudulently using our brand. This could be an email, letter or phone call to you, or through a website illegally using our branding. We do not condone this activity and advise you to contact us immediately on 0800 300 400 (or 64 7 838 7863 from overseas) if you have concerns about any communication you receive, or appear to have received, from us. We take this very seriously and work with authorities within New Zealand to address these attacks. We would like to remind our customers that Genesis Energy will never ask you for your password and will never ask you by email for personal information (like account or credit card details). You should never provide personal information, whether online or over the phone, unless you are sure it is for a genuine purpose. Scam emails are currently circulating that pretend to be from reputable energy companies, which claim you owe money for an outstanding gas or electricity bill and ask you to click on a link to view your account or to make a payment. Please note these scam emails contain links which redirects the user to malicious malware. 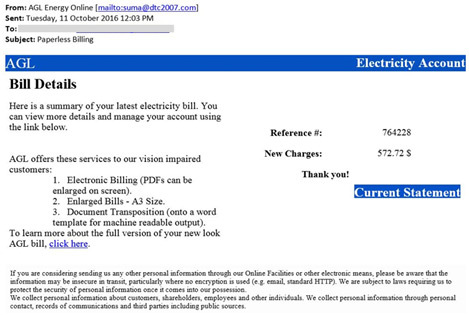 We would like to warn our customers that these emails have no relationship with your Genesis Energy account.